Whoa! Perfect for Camping or The Backyard! Hammock just $6.99! Use coupon code VNEVST7C for 50% off! Just $6.99! ❶【STRENGTH】Constructed of breathable and fast-drying 210T parachute nylon with triple-needle stitching. It is enough to hold up to 2 adults ! 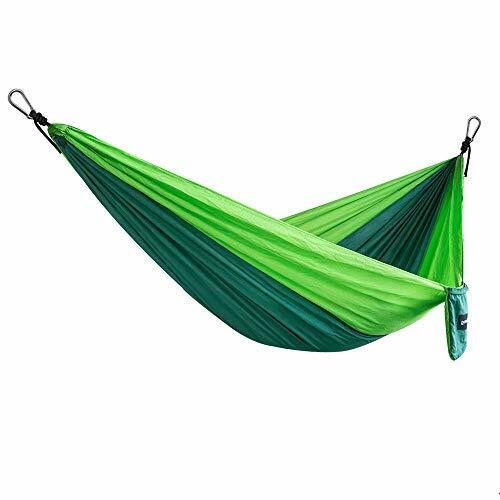 It also have a lagre size(270 x 140cm) and easy to be cleaned by hand wash.
❷【LIGHTWEIGHT & COMPACT】This hammock weights only 567g ( Includes 2 carabiners and 2 ropes), can be easily stored in the sewn-in storage bag (Equivalent to a volleyball size), which makes it perfect for backpacking, camping, travel, hiking, general exploration. ❸【FAST AND EASY SETUP】Includes stainless steel carabiners and ropes allowing you to secure the hammock to trees, poles, boat masts, or anything else sturdy, make setting this up both fast and extremely simple for even the most novice user! ❹【MULTIFUNCTIONAL】Great for camping in your own back yard or to use at the courtyard during for comfortable evening with friends and family; can also be used indoors, when unexpected guests or kids stay overnight. It also can be used as a tent, sleeping pad, ground mat, swing, cradle, or yoga mat to let you enjoy the fun and relaxing time freely. ❺【100% SATISFACTION GUARANTEE】Covered by 60-day warranty. If you have any question about our camping hammock, please contact us,we will give you a positive response within 24 hour.